Below you will find some information on how to perform common tasks. You can find the most recent version of this guide here. create-react-app is a global command-line utility that you use to create new projects. react-scripts is a development dependency in the generated projects (including this one). You almost never need to update create-react-app itself: it delegates all the setup to react-scripts. When you run create-react-app, it always creates the project with the latest version of react-scripts so you’ll get all the new features and improvements in newly created apps automatically. To update an existing project to a new version of react-scripts, open the changelog, find the version you’re currently on (check package.json in this folder if you’re not sure), and apply the migration instructions for the newer versions. In most cases bumping the react-scripts version in package.json and running npm install in this folder should be enough, but it’s good to consult the changelog for potential breaking changes. We commit to keeping the breaking changes minimal so you can upgrade react-scripts painlessly. We are always open to your feedback. You may create subdirectories inside src. For faster rebuilds, only files inside src are processed by Webpack. You need to put any JS and CSS files inside src, or Webpack won’t see them. Only files inside public can be used from public/index.html. You can, however, create more top-level directories. They will not be included in the production build so you can use them for things like documentation. Object Rest/Spread Properties (stage 3 proposal). Class Fields and Static Properties (stage 2 proposal). Learn more about different proposal stages. While we recommend to use experimental proposals with some caution, Facebook heavily uses these features in the product code, so we intend to provide codemods if any of these proposals change in the future. If you use any other ES6+ features that need runtime support (such as Array.from() or Symbol), make sure you are including the appropriate polyfills manually, or that the browsers you are targeting already support them. To configure the syntax highlighting in your favorite text editor, head to the relevant Babel documentation page and follow the instructions. Some of the most popular editors are covered. Some editors, including Sublime Text, Atom, and Visual Studio Code, provide plugins for ESLint. They are not required for linting. You should see the linter output right in your terminal as well as the browser console. However, if you prefer the lint results to appear right in your editor, there are some extra steps you can do. You would need to install an ESLint plugin for your editor first. We recognize that this is suboptimal, but it is currently required due to the way we hide the ESLint dependency. The ESLint team is already working on a solution to this so this may become unnecessary in a couple of months. This feature is currently only supported by Visual Studio Code editor. 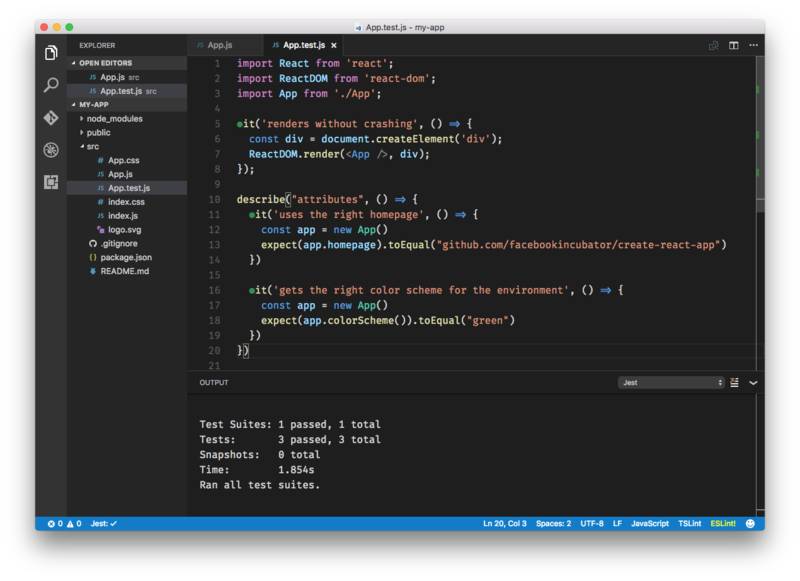 Visual Studio Code supports live-editing and debugging out of the box with Create React App. This enables you as a developer to write and debug your React code without leaving the editor, and most importantly it enables you to have a continuous development workflow, where context switching is minimal, as you don’t have to switch between tools. You would need to have the latest version of VS Code and VS Code Chrome Debugger Extension installed. Then add the block below to your launch.json file and put it inside the .vscode folder in your app’s root directory. Start your app by running npm start, and start debugging in VS Code by pressing F5 or by clicking the green debug icon. You can now write code, set breakpoints, make changes to the code, and debug your newly modified code—all from your editor. You can find the source HTML file in the public folder of the generated project. You may edit the <title> tag in it to change the title from “React App” to anything else. Note that normally you wouldn’t edit files in the public folder very often. For example, adding a stylesheet is done without touching the HTML. If you need to dynamically update the page title based on the content, you can use the browser document.title API. For more complex scenarios when you want to change the title from React components, you can use React Helmet, a third party library. This project setup supports ES6 modules thanks to Babel. While you can still use require() and module.exports, we encourage you to use import and export instead. export default Button; // Don’t forget to use export default! Be aware of the difference between default and named exports. It is a common source of mistakes. We suggest that you stick to using default imports and exports when a module only exports a single thing (for example, a component). That’s what you get when you use export default Button and import Button from './Button'. Named exports are useful for utility modules that export several functions. A module may have at most one default export and as many named exports as you like. When to use the curly braces? This is not required for React but many people find this feature convenient. You can read about the benefits of this approach here. However you should be aware that this makes your code less portable to other build tools and environments than Webpack. In development, expressing dependencies this way allows your styles to be reloaded on the fly as you edit them. In production, all CSS files will be concatenated into a single minified .css file in the build output. If you are concerned about using Webpack-specific semantics, you can put all your CSS right into src/index.css. It would still be imported from src/index.js, but you could always remove that import if you later migrate to a different build tool. This project setup minifies your CSS and adds vendor prefixes to it automatically through Autoprefixer so you don’t need to worry about it. If you need to disable autoprefixing for some reason, follow this section. Generally, we recommend that you don’t reuse the same CSS classes across different components. For example, instead of using a .Button CSS class in <AcceptButton> and <RejectButton> components, we recommend creating a <Button> component with its own .Button styles, that both <AcceptButton> and <RejectButton> can render (but not inherit). Following this rule often makes CSS preprocessors less useful, as features like mixins and nesting are replaced by component composition. You can, however, integrate a CSS preprocessor if you find it valuable. In this walkthrough, we will be using Sass, but you can also use Less, or another alternative. Note: To use a different preprocessor, replace build-css and watch-css commands according to your preprocessor’s documentation. Now you can rename src/App.css to src/App.scss and run npm run watch-css. The watcher will find every Sass file in src subdirectories, and create a corresponding CSS file next to it, in our case overwriting src/App.css. Since src/App.js still imports src/App.css, the styles become a part of your application. You can now edit src/App.scss, and src/App.css will be regenerated. To share variables between Sass files, you can use Sass imports. For example, src/App.scss and other component style files could include @import "./shared.scss"; with variable definitions. At this point you might want to remove all CSS files from the source control, and add src/**/*.css to your .gitignore file. It is generally a good practice to keep the build products outside of the source control. Now running npm start and npm run build also builds Sass files. Note that node-sass seems to have an issue recognizing newly created files on some systems so you might need to restart the watcher when you create a file until it’s resolved. With Webpack, using static assets like images and fonts works similarly to CSS. This ensures that when the project is built, Webpack will correctly move the images into the build folder, and provide us with correct paths. Please be advised that this is also a custom feature of Webpack. It is not required for React but many people enjoy it (and React Native uses a similar mechanism for images). An alternative way of handling static assets is described in the next section. The public folder contains the HTML file so you can tweak it, for example, to set the page title. The <script> tag with the compiled code will be added to it automatically during the build process. You can also add other assets to the public folder. Scripts and stylesheets get minified and bundled together to avoid extra network requests. However there is an escape hatch that you can use to add an asset outside of the module system. If you put a file into the public folder, it will not be processed by Webpack. Instead it will be copied into the build folder untouched. To reference assets in the public folder, you need to use a special variable called PUBLIC_URL. Only files inside the public folder will be accessible by %PUBLIC_URL% prefix. If you need to use a file from src or node_modules, you’ll have to copy it there to explicitly specify your intention to make this file a part of the build. When you run npm run build, Create React App will substitute %PUBLIC_URL% with a correct absolute path so your project works even if you use client-side routing or host it at a non-root URL. // as described in “Adding Images and Fonts” above this section. None of the files in public folder get post-processed or minified. Some library may be incompatible with Webpack and you have no other option but to include it as a <script> tag. Note that if you add a <script> that declares global variables, you also need to read the next section on using them. When you include a script in the HTML file that defines global variables and try to use one of these variables in the code, the linter will complain because it cannot see the definition of the variable. This makes it obvious you are using a global variable intentionally rather than because of a typo. Alternatively, you can force the linter to ignore any line by adding // eslint-disable-line after it. // components takes precedence over default styles. Now you are ready to use the imported React Bootstrap components within your component hierarchy defined in the render method. Here is an example App.js redone using React Bootstrap. Sometimes you might need to tweak the visual styles of Bootstrap (or equivalent package). Create a new package that depends on the package you wish to customize, e.g. Bootstrap. Add the necessary build steps to tweak the theme, and publish your package on npm. Install your own theme npm package as a dependency of your app. Here is an example of adding a customized Bootstrap that follows these steps. Recent versions of Flow work with Create React App projects out of the box. Run npm install --save-dev flow-bin (or yarn add --dev flow-bin). Run npm run flow -- init (or yarn flow -- init) to create a .flowconfig file in the root directory. Add // @flow to any files you want to type check (for example, to src/App.js). Now you can run npm run flow (or yarn flow) to check the files for type errors. You can optionally use an IDE like Nuclide for a better integrated experience. In the future we plan to integrate it into Create React App even more closely. These environment variables will be defined for you on process.env. For example, having an environment variable named REACT_APP_SECRET_CODE will be exposed in your JS as process.env.REACT_APP_SECRET_CODE. During the build, process.env.REACT_APP_SECRET_CODE will be replaced with the current value of the REACT_APP_SECRET_CODE environment variable. Remember that the NODE_ENV variable will be set for you automatically. The above form is looking for a variable called REACT_APP_SECRET_CODE from the environment. In order to consume this value, we need to have it defined in the environment. This can be done using two ways: either in your shell or in a .env file. Both of these ways are described in the next few sections. Many popular libraries use decorators in their documentation. It is an experimental proposal and is subject to change. The current specification version is not officially supported by Babel. If the specification changes, we won’t be able to write a codemod because we don’t use them internally at Facebook. However in many cases you can rewrite decorator-based code without decorators just as fine. Create React App will add decorator support when the specification advances to a stable stage. These tutorials will help you to integrate your app with an API backend running on another port, using fetch() to access it. Check out this tutorial. You can find the companion GitHub repository here. People often serve the front-end React app from the same host and port as their backend implementation. Such setup is not required. However, if you do have a setup like this, it is convenient to write requests like fetch('/api/todos') without worrying about redirecting them to another host or port during development. This way, when you fetch('/api/todos') in development, the development server will recognize that it’s not a static asset, and will proxy your request to http://localhost:4000/api/todos as a fallback. The development server will only attempt to send requests without a text/html accept header to the proxy. Fetch API cannot load http://localhost:4000/api/todos. No 'Access-Control-Allow-Origin' header is present on the requested resource. Origin 'http://localhost:3000' is therefore not allowed access. If an opaque response serves your needs, set the request's mode to 'no-cors' to fetch the resource with CORS disabled. Keep in mind that proxy only has effect in development (with npm start), and it is up to you to ensure that URLs like /api/todos point to the right thing in production. You don’t have to use the /api prefix. Any unrecognized request without a text/html accept header will be redirected to the specified proxy. The proxy option supports HTTP, HTTPS and WebSocket connections. Enable CORS on your server (here’s how to do it for Express). Use environment variables to inject the right server host and port into your app. You may require the dev server to serve pages over HTTPS. One particular case where this could be useful is when using the "proxy" feature to proxy requests to an API server when that API server is itself serving HTTPS. Note that the server will use a self-signed certificate, so your web browser will almost definitely display a warning upon accessing the page. Then, on the server, regardless of the backend you use, you can read index.html into memory and replace __OG_TITLE__, __OG_DESCRIPTION__, and any other placeholders with values depending on the current URL. Just make sure to sanitize and escape the interpolated values so that they are safe to embed into HTML! If you use a Node server, you can even share the route matching logic between the client and the server. However duplicating it also works fine in simple cases. There are also opportunities to use this outside of static hosting, to take the pressure off the server when generating and caching routes. You can read more about zero-configuration pre-rendering (also called snapshotting) here. Then, on the server, you can replace __SERVER_DATA__ with a JSON of real data right before sending the response. The client code can then read window.SERVER_DATA to use it. Make sure to sanitize the JSON before sending it to the client as it makes your app vulnerable to XSS attacks. We recommend to put the test files (or __tests__ folders) next to the code they are testing so that relative imports appear shorter. For example, if App.test.js and App.js are in the same folder, the test just needs to import App from './App' instead of a long relative path. Colocation also helps find tests more quickly in larger projects. When you run npm test, Jest will launch in the watch mode. Every time you save a file, it will re-run the tests, just like npm start recompiles the code. By default, when you run npm test, Jest will only run the tests related to files changed since the last commit. This is an optimization designed to make your tests runs fast regardless of how many tests you have. However it assumes that you don’t often commit the code that doesn’t pass the tests. This test mounts a component and makes sure that it didn’t throw during rendering. Tests like this provide a lot value with very little effort so they are great as a starting point, and this is the test you will find in src/App.test.js. Additionally, you might find jest-enzyme helpful to simplify your tests with readable matchers. The above contains code can be written simpler with jest-enzyme. To setup jest-enzyme with Create React App, follow the instructions for initializing your test environment to import jest-enzyme. The test command will force Jest to run tests once instead of launching the watcher. If you find yourself doing this often in development, please file an issue to tell us about your use case because we want to make watcher the best experience and are open to changing how it works to accommodate more workflows. If you know that none of your tests depend on jsdom, you can safely remove --env=jsdom, and your tests will run faster. Usually, it’s hard to see these states without running a sample app or some examples. Create React App doesn’t include any tools for this by default, but you can easily add React Storybook to your project. It is a third-party tool that lets you develop components and see all their states in isolation from your app. You can also deploy your Storybook as a static app. This way, everyone in your team can view and review different states of UI components without starting a backend server or creating an account in your app. After that, follow the instructions on the screen. You can turn your React app into a Progressive Web App by following the steps in this repository. npm run build creates a build directory with a production build of your app. Set up your favourite HTTP server so that a visitor to your site is served index.html, and requests to static paths like /static/js/main.<hash>.js are served with the contents of the /static/js/main.<hash>.js file. The last command shown above will serve your static site on the port 5000. Like many of serve’s internal settings, the port can be adjusted using the -p or --port flags. See the Modulus blog post on how to deploy your react app to Modulus. now offers a zero-configuration single-command deployment. Install the now command-line tool either via the recommended desktop tool or via node with npm install -g now. Install serve by running npm install --save serve. Paste that URL into your browser when the build is complete, and you will see your deployed app. Details are available in this article. Install the Surge CLI if you haven’t already by running npm install -g surge. Run the surge command and log in you or create a new account. You just need to specify the build folder and your custom domain, and you are done. You can adjust various development and production settings by setting environment variables in your shell or with .env. BROWSER :white_check_mark: :x: By default, Create React App will open the default system browser, favoring Chrome on macOS. Specify a browser to override this behavior, or set it to none to disable it completely. HOST :white_check_mark: :x: By default, the development web server binds to localhost. You may use this variable to specify a different host. PORT :white_check_mark: :x: By default, the development web server will attempt to listen on port 3000 or prompt you to attempt the next available port. You may use this variable to specify a different port. HTTPS :white_check_mark: :x: When set to true, Create React App will run the development server in https mode. PUBLIC_URL :x: :white_check_mark: Create React App assumes your application is hosted at the serving web server's root or a subpath as specified in package.json (homepage). Normally, Create React App ignores the hostname. You may use this variable to force assets to be referenced verbatim to the url you provide (hostname included). This may be particularly useful when using a CDN to host your application. CI :large_orange_diamond: :white_check_mark: When set to true, Create React App treats warnings as failures in the build. It also makes the test runner non-watching. Most CIs set this flag by default. When you save a file while npm start is running, the browser should refresh with the updated code. If your project is in a Dropbox folder, try moving it out. If the watcher doesn’t see a file called index.js and you’re referencing it by the folder name, you need to restart the watcher due to a Webpack bug. Some editors like Vim and IntelliJ have a “safe write” feature that currently breaks the watcher. You will need to disable it. Follow the instructions in “Working with editors supporting safe write”. If your project path contains parentheses, try moving the project to a path without them. This is caused by a Webpack watcher bug. On Linux and macOS, you might need to tweak system settings to allow more watchers. If the project runs inside a virtual machine such as (a Vagrant provisioned) VirtualBox, create an .env file in your project directory if it doesn’t exist, and add CHOKIDAR_USEPOLLING=true to it. This ensures that the next time you run npm start, the watcher uses the polling mode, as necessary inside a VM. If none of these solutions help please leave a comment in this thread. If you run npm test and the console gets stuck after printing react-scripts test --env=jsdom to the console there might be a problem with your Watchman installation as described in facebookincubator/create-react-app#713. You can find other installation methods on the Watchman documentation page. If this still doesn’t help, try running launchctl unload -F ~/Library/LaunchAgents/com.github.facebook.watchman.plist. There are also reports that uninstalling Watchman fixes the issue. So if nothing else helps, remove it from your system and try again. It is reported that npm run build can fail on machines with no swap space, which is common in cloud environments. If the symptoms are matching, consider adding some swap space to the machine you’re building on, or build the project locally. This may be a problem with case sensitive filenames. Please refer to this section. If you have ideas for more “How To” recipes that should be on this page, let us know or contribute some!